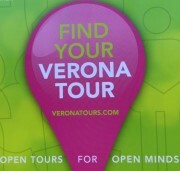 VERONA FOOD TOUR See the city from a foodie's perspective! Buon appetito! Experience the easy Veronese attitude to street food. It’s more than brunch, almost a lunch. We walk to 5-6 eateries in Verona to taste local specialties and meet the keepers and the local producers. On the go we might sample: hand-made salami and soppressa, tortellini with unexpected, delicious filling, creamy polenta, the "polka dot" mortadella with local wine, our superb Monte Veronese cheese, zaletti combined with sweet Recioto wine or puffy pastries and the excellent "mattonella" gelato. Accordingly to the EXPO 2015 philosophy, we offer season products, very often connected to the main religious festivities: do expect special tastings on All Saints, Santa Lucia, Christmas, Carnival, Easter! EXCLUSION: All tastings and drinks (consider an average expense of 20-25 euros per person for food and drinks). CHILD POLICY: Children under 15 years of age are free of charge.